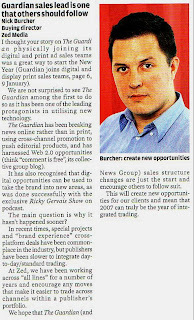 "I thought your story on The Guardian physically joining their digital and print ad sales team was a great way to start the New Year! We are not surprised to see The Guardian among the first to do so as they have been one of the leading protagonists in utilising new technology. The Guardian have been breaking news online rather than in print, use cross-channel promotion to push editorial products, and have harnessed Web 2.0 opportunities (think ‘comment is free’, their collective group blog). They have also recognised that digital opportunities can be used to take their brand into new areas, which was done successfully with the exclusive Ricky Gervais Show on podcast. The main question is why it hasn’t happened sooner? In recent times special projects and ‘brand experience’ cross-platform deals have been commonplace in the industry, but publishers have been slower to integrate day to day / standard trading. At Zed we have been working across ‘All Lines’ for a number of years and encourage any moves that make it easier to trade across channels within a publishers portfolio. We hope that the Guardian (and News Group) sales structure changes are just the start, and encourage others to follow suit. This will create new opportunities for our clients and mean that 2007 can truly be the year of integrated trading!"